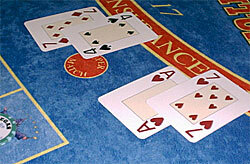 The Red 7 card counting system is the unbalanced which is offered for blackjack enthusiasts to master and employ. The unbalanced notion means that you will not end your whole deck count with number 0 as if it was a balanced one. You will end your count with +2 result instead. The main peculiarity of the considered system lays in the separate count of 7's. Thus we divide this card value into two expected groups: blacks and reds. It is believed that such a special feature supplies a player with increased chances for winning and your general advantage over the house. Not out of place to mention that the system name Red 7 speaks for itself and thus help the player to remember the mechanisms it presents. For better understanding let's consider the Red 7 card count method chart at once. As we see, the red 7's now count +1 and the black ones will provide you with zero count. This specific feature complicates the whole count procedure a bit (e.g. in comparison with another unbalanced system - the KO method). So right here we see 22 (in general) small cards which count +1, 10 middle cards which provide zero count and 20 big cards formed with 10-value cards + an Ace which possess the negative -1 count. As and with other systems for card counting, the main purpose for a player to possess the counting is the information it gives. E.g. it's much better for a player to play risky and bet more money when the count is positive. Thus you know that the majority of little cards have already left the deck. By-turn it means that the player chances to get high value card has increased and the dealer odds to go bust as well. And vice versa - it's okay to play cautiously and bet less money when the count shows you the negative rates. Thus more 10's, J's, Q's, K's and A's resign the deck and no more chances for you to get favorable points total and win in whole. Be sure you memorize all the card values and practice this knowledge well - before you sit the casino table for real a gameplay.